A Trump presidency would be a catastrophe, whereas a big win by Clinton creates an opening for change. in the Democratic primary, and we remain concerned about Clinton’s approach to politics and governing. But Clinton isn’t running against Sanders anymore. The first case for Clinton can be summed up in two words: Donald Trump. The first case for Clinton can be summed up in two words: Donald Trump. In the contest between hope and cynicism, justice and prejudice, solidarity and selfishness, we can be absolutely certain that Trump is not on our side. Given the perils facing our country and our planet, we believe that Trump’s election would be a catastrophe for the United States—and for the world. We also believe our best chance right now to advance the cause of justice, rather than spend the next four years on the defensive, is to elect Clinton—and give her coattails long enough to elect a Congress committed to turning the progressive rhetoric of the Democratic Party platform into concrete legislation. Trump’s manipulation of racism and xenophobia, his attacks on the press and the judiciary, his demonization of his opponents and gleeful encouragement of violence by his supporters, may not fit the dictionary definition of fascism, but they pose a clear and present danger to our Republic. Taken at his word, Trump’s America would be a country where the forces of hatred, fear, and division animate the body politic—and are in turn amplified by the mechanisms of state power. Mass deportations would victimize millions of our neighbors while molding America into a society of stool pigeons and informants. A national stop-and-frisk program would turn our cities into racial combat zones. Trump would repeal the Affordable Care Act and close off, perhaps forever, the route to universal health care. Far from expressing remorse over his own tax evasion, Trump boasts that it was “smart.” His tax plan would lock in this grotesque favoritism toward the ultrarich at the expense of the poor and middle class by cutting the corporate tax rate by more than half while shredding the social safety net. In Trump’s America, workers would see their rights rolled back, their unions hobbled, their pensions looted, and their wages—which Trump says are “too high”—cut. Women would see their reproductive rights attacked, including the defunding of Planned Parenthood, and their claim to equal pay for equal work dismissed. Hard-won victories in the fight for gay rights would be endangered. And Trump’s energy policy—one that denies climate change, doubles down on fossil fuels, strangles incentives for renewable energy, and guts the regulations that protect our air and water—would flood our coasts, burn our forests, parch our cities, and leave the whole planet a smoldering wasteland. On foreign policy, Trump’s at-times-incisive criticism of trade deals, disregard for the Cold War consensus, and skeptical approach to nation-building must be balanced against a daily torrent of ignorant, offensive, and alarming views. How can someone who routinely demeans Latinos and Muslims expect to conduct effective diplomacy with Latin America or the Muslim world? How can someone who views the revelations of Abu Ghraib not as an indelible stain on America, but as a model—“We’re going to have to do things that are unthinkable”—exercise any claim to global leadership? Trump’s repeated calls to bar Muslims from entering the United States underscore not only his disdain for international law and basic human rights, but his alarming ignorance of our country’s historic rejection of religious tests for citizenship. A Trump administration would target the families of suspected terrorists, making the murder of innocent women and children official policy. He promises to keep Guantánamo open and load it up with “bad dudes.” He wants to sharply increase US military spending, expand the use of drones in overseas conflicts, renege on the normalization of US–Cuban relations, ramp up confrontation with China, and unravel the nuclear deal with Iran. While we desperately need an alternative foreign policy, Trump’s cavalier approach to nuclear proliferation and his willingness to treat our allies like chumps in a global protection racket would make the world a far more dangerous place. Trump leads a party that has sought to normalize a cruel and unusual politics. The perils of Trumpism go beyond one man. Trump leads a party that has sought to normalize a cruel and unusual politics that rivals that of the European right-wing. Throughout the election, Trump has insulted women, questioned the patriotism of Mexican and Muslim Americans, incited hatred of refugees, mocked a disabled journalist, and depicted the lives of African Americans as “a total catastrophe.” While it’s tempting to cast this rampant disregard of social norms as novel, Trump’s crude and demeaning conduct in fact emanates directly from the Fox News and alt-right power brokers that he has empowered to lead his campaign. Likewise, his repeated warnings that this election will be “rigged” is not just an effort to delegitimize his opponent and disempower those groups, such as African-American voters, who have been most loyal to Clinton; it is an assault on the very basis of democratic governance itself, a tendency that has bloomed on the right since the election of Barack Obama. Finally, the next president will also determine the balance of the Supreme Court. If elected, Trump would be able to fulfill his promise to appoint a new justice “as close to [Antonin Scalia] as I can find”—thus tipping the balance of a currently divided court back toward reaction, with several more nominees potentially to come. The Supreme Court alone should motivate progressives in our determination to keep Trump out of the White House. And, make no mistake, the only sure vote to keep Trump out of the White House is a vote for Hillary Clinton. Clinton has more than demonstrated her intelligence, tenacity, ferocious work ethic, and seriousness of purpose. Clinton showed grace in refusing to be deflected by Trump’s posturing and prevarications. But she has also shown grace in the way she’s responded to the pressure that Sanders and the movements that powered his campaign created. Clinton has long been an advocate for women, children, and the disabled. But now she seeks the presidency as a supporter of action to address climate change, criminal-justice reform, LGBTQ equality, respect for immigrants, debt-free public higher education, the expansion of Social Security, a public option to challenge health-care profiteering, and a great big hike in the minimum wage. Thanks to a populist wave—and her willingness to listen to it—Clinton is running on the most progressive platform in the modern history of the Democratic Party. We want to see that platform put into action. That’s why we believe Clinton needs not just to defeat Trump, but to demolish him. If she doesn’t win big, and if the Democrats don’t make significant advances in Congress, obstruction will remain the order of the day, and progress will be stymied at a time when America is desperately in need of—and genuinely ready for—radical renewal. On the other hand, a big win would empower a progressive bloc of newcomers in Congress like Zephyr Teachout, Jamie Raskin, and Pramila Jayapal, and give progressive champions like Sanders, Elizabeth Warren, Sherrod Brown, and Russ Feingold—who is campaigning to return to the Senate—real authority to shape legislation, expose inequality, rein in Wall Street, and make government work on behalf of those who need it most. We agree with Bernie. On almost every issue you can think of, Clinton is so much better than Trump that comparison seems like a meaningless exercise. This does not constitute a blank check or a wholesale endorsement. Clinton’s enduring ties to Wall Street and corporate CEOs mean that progressives will have to continue to push her on trade, financial regulation, taxation, and public investment. The Nation also stands ready to support Warren and others in making sure Clinton’s cabinet officials and economic advisers are subjected to a searching scrutiny. Clinton’s hawkish foreign-policy reflexes also raise grave concerns. She has frequently embraced positions to the right of President Obama, and has been embraced in turn by a rogues’ gallery of neoconservative and liberal- hawk advisers who together personify a failed bipartisan foreign-policy consensus. She’s backed regime change from Honduras to Libya to Syria, upholding the view that America is the “indispensable nation” entitled to police the world. Her blinkered view of Israel and Palestine offers no comfort to those who long for a just peace in the Middle East. 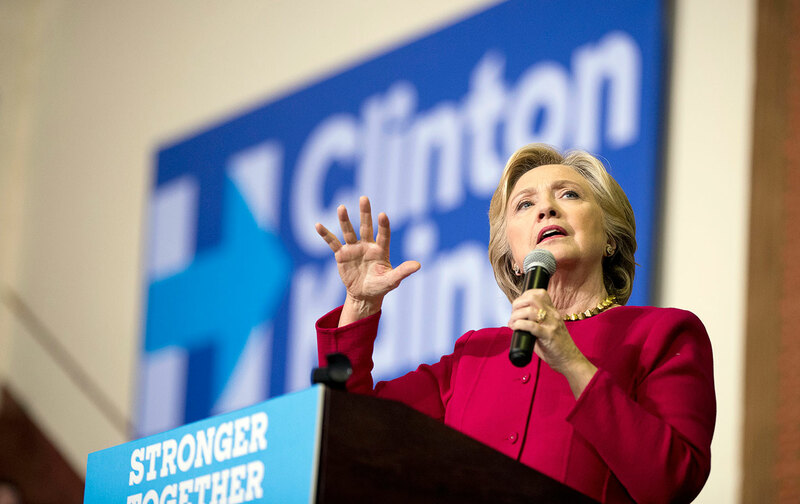 Instead of seeking to engage Russia—an essential partner in resolving the crisis in Syria and the conflict in Ukraine, as well as combating nuclear proliferation and addressing climate change—Clinton seems intent on deepening a new Cold War. Even as we endorse her, we understand that it will be incumbent on us to challenge President Clinton to break her hawkish habits and move toward a new and progressive realism. Stein’s cause has not been helped by the Green Party’s reluctance, or inability, to seek, share, and build power. What about Jill Stein? In Europe, the Greens have emerged as an effective voice—and conscience—for the environmental left. We would still like to see Stein and Libertarian candidate Gary Johnson included in the presidential debates, and we respect the challenge that both have raised to a frequently dysfunctional two-party system. But we cannot agree with Johnson’s penchant for privatization and survival-of-the-fittest economics. And while we share many of the views that Stein has advanced, her cause has not been helped by the Green Party’s reluctance, or inability, to seek, share, and build power, with all the messy compromise this often entails. Instead of the patient—and Sisyphean—task of building an authentic grassroots alternative, the Greens offer a top-down vehicle for protest. If this were an ordinary election, there would be little reason to depart from the practice of strategic voting, which requires only swing-state voters to choose between the lesser of two evils. But 2016 is not an ordinary election. We know that some readers will find it hard to vote for Clinton; we ask them to think again. Not just about forgoing the advances that a Clinton administration could achieve if progressives were empowered: stopping the Trans-Pacific Partnership; overturning Citizens United; debt-free college; a path to citizenship for immigrants; paid family leave; the biggest investment in jobs since World War II; and an administration that looks like America today. But also to reconsider the balance between expressing their own disgust and diminishing the size of Trump’s repudiation. Without question, a Trump victory would represent much more than a temporary setback. At best, it would throw movements that have made enormous strides in the past year on the defensive. At worst, that tremendous reservoir of movement energy might well dissipate—or evaporate in the heat of despair, amid recriminations about opportunities missed. And for millennial voters, many of whom were inspired by Sanders to engage electoral politics for the first time, a Trump presidency would spell a generation of ecological and economic ruin. We cannot risk that fate. Over the past eight years, progressives have learned the hard way that voting for hope and change doesn’t always deliver hope or change. So while voting for Clinton may be necessary, it is hardly sufficient. Clinton now stands with progressives on a host of issues, from health care to climate change. On criminal justice and trade policy, she’s moved left even when that involved renouncing her husband’s legacy. On foreign policy, we still have much work to do. All the more reason, then, to stay mobilized. For progressives, a Clinton victory should be cause for organization, not celebration. Unless we stay right on top of her administration—watching, protesting, demanding—she may abandon her newfound progressive positions. What we don’t know—and won’t ever know, unless she’s elected—is how far we might push her. As Frederick Douglass noted, “Power concedes nothing without a demand.” How much might an administration that relies on our votes, but is far from certain of getting them, accomplish at our demand? There is only one result in November that will give us the chance to find out.